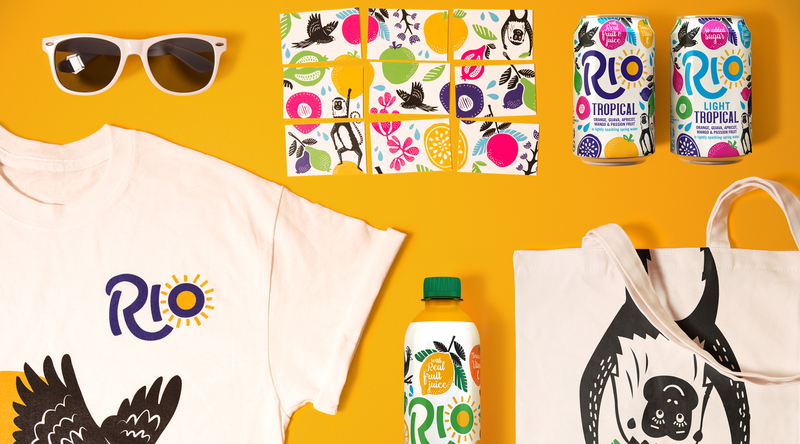 The Dieline chats to Pearlfisher about its reinvention of Rio. 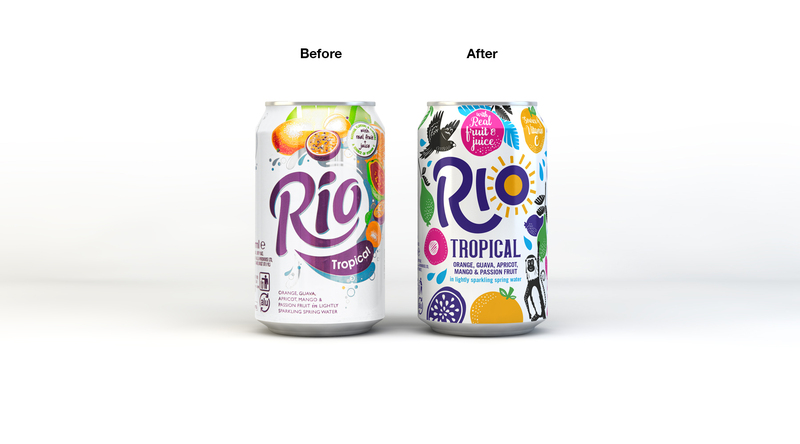 Rio beverages are natural alternative to fizzy, fruitless soft drinks that first appeared in the 1980s. They turned to Pearlfisher for an update that would stay true to the drink’s Brazilian roots but give it a more modern appeal. We spoke with Pearlfisher to learn more about creating the brand’s cheery disposition, expanding Rio’s appeal, and more. Pearlfisher: As with every project that comes through Pearlfisher, our design process starts with research by our Futures team into the consumer, category and cultural shifts taking place within the client’s context. 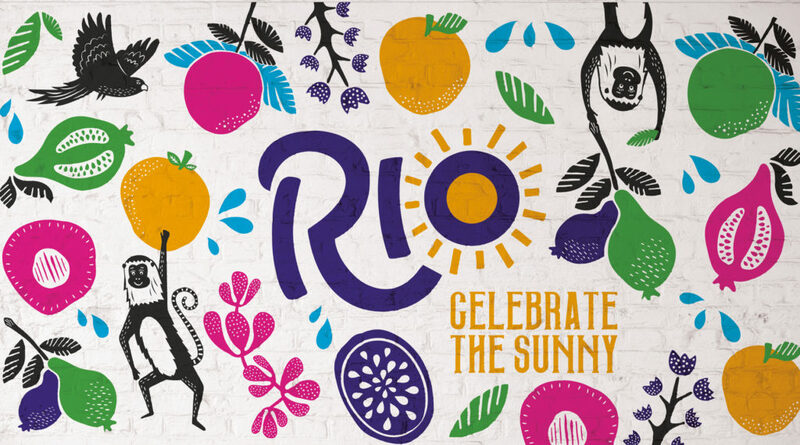 Using this insight as a lens through which to consider Rio’s role in the life of its consumer—a young, down-to-earth demographic with a balanced approach to health—our Strategy team then repositioned the brand, identifying an opportunity for Rio to own a “feel-good moment” in a day. Using the design essence—”Celebrate the Sunny”—as a basis for exploration, our Design team conceived a number of identity routes and worked with the client to develop, refine and perfect their chosen direction for expression. What was one of the biggest goals you set out to achieve with Rio packaging, and how did you accomplish it? Pearlfisher: When Rio first launched back in the mid-80s—at a time of flamboyance and flair, and when global travel was largely the preserve of the rich and famous—both the name and taste were exotic and intriguing. However, as consumer tastes and lifestyles have evolved, Rio’s look has become dated, kitsch and stuck in the era in which it was conceived. We were tasked with dialling up the brand’s emotional connection with customers—or, as we frame the challenge at Pearlfisher, reinventing its desirability. We’ve achieved this by creating a bright, vibrant and uplifting visual identity system that is inspired by the brand’s heritage—the people, culture and energy of Brazil—but brings the charisma and positivity at the heart of the brand to life for a global, contemporary audience. We’ve also defined a new tone of voice that inspires a more aspirational engagement with consumers, and translates across all the brand’s communications channels. What elements did you include to highlight that Rio Tropical is a soft drink that uses real fruit, rather than an artificially flavoured beverage? Pearlfisher: Our design heroes colourful, luscious fruits to champion the quality of Rio’s real fruit flavours, and elements of the natural world—branches, birds, monkeys, water droplets—to celebrate its naturalness. We’ve also seamlessly integrated the brand’s nutritional claims—“No added sugar” (for Rio Tropical Light), “Made with real fruit and juice” and “A source of vitamin C”—into the design in a way that feels natural and unimposing. Rio will immediately put a smile on your face and gives you a warm, happy feeling. How do you capture something like emotion and translate it into packaging? Pearlfisher: Rio is indeed a happy brand, and we wanted not only to reflect the “small moment of sunshine” that a sip of Rio brings us in a busy day, but to augment it. Pearlfisher: This was a fantastic project to work on—the client and manufacturing teams were invested, collaborative and reactive, which made it a great partnership and working relationship. The greatest challenge, therefore, was inherent within the brief: how to take a brand that is uniquely both a challenger and an icon, loved by everyone but available primarily in corner shops, and accelerate its growth by expanding its appeal? We’ve achieved this by developing an adaptive design language that gives the team the creative freedom they need to bring the brand to life across all touch points—from murals, packaging and in-store activations, to website, printed, social media and campaign collateral. Pearlfisher: Probably that we’ve given the brand a real character that people can relate to and have fun with. Most importantly, we’ve given the Rio team a base from which to build and activate the brand. For example, we created a series of “brand mascots”—the monkey, the bird, etc.—which Rio has now launched public competitions to name. Pearlfisher: From a technical point of view, this project has definitely shown the benefit of fully understanding the print process at concept stage. The importance and weight of Realisation was reinforced—it’s easy to underestimate how much time and consideration went into creating the seemingly “randomised” and “natural” flow to the design, which comes to life across all the brand’s elements. This interview originally appeared on The Dieline, here.